I would say that one of the main factors, that make me listen to a record repeatedly, is how much I can identify with it on a personal level, since I find little to no sense in listening to music that gives me nothing in return for my time spent. Now, what you take from music is very subjective and can differ strongly from case to case: some might be into lyrics, others more into the feeling that the instrumentation gives them, and so forth. 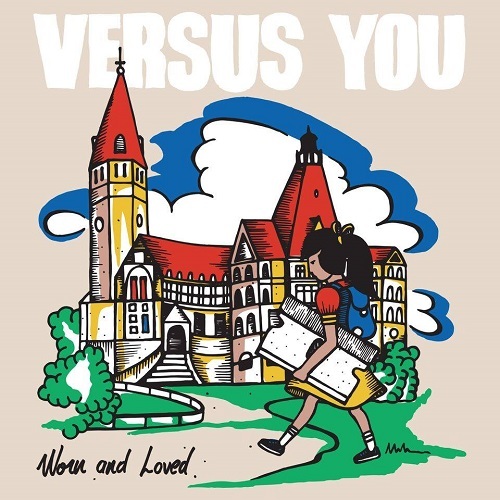 Well, today I have the pleasure of writing a piece about a record that manages to push just the right buttons on several levels: Versus You‘s fourth full-length called Worn And Loved, which is going to be released this Friday, March 15th. So let’s go! In essence, this new record is a return to what worked really well on the predecessor, Moving On, and delivers top notch pop punk. Even though I would say that it’s less on the pop side this time around, it still maintains super catchy and each song has an instant recognizability to it. In the five years that have passed between records, the quartet has switched drummers and I feel like he brings a breath of fresh air behind the kit. While I had nothing to fault in the past, I find the drumming even more diverse and full of small surprises this time around. I also really want to make a Spinal Tap joke here…but nothing good comes to mind. When it comes to the guitar work, I am always impressed by the prolific songwriting that can be found in Eric Rosenfeld’s songs, no matter which moniker he releases them under. While the complexity is never on a virtuoso level, the execution and songwriting definitely are, because I dare you not to whistle along to the main riff of at least half of the thirteen tracks on your first listen. Which brings me back to what I said at the beginning: music is, for the most part, subjective and I always welcome well-written and uplifting music with open arms. Despite the mostly happy sounding instrumentation, W&L is not a happy go lucky album by any means…and that is exactly what makes it so good. The thirty-five minute musical journey deals with many feelings and situations that people experience growing up. It is a raw representation of the many struggles that teenagers and young adults, that are often not touched upon by society as a whole. Be it anxiety over never being able to satisfy expectations of our parents or our friends, being alienated by our peers, or vice versa. All in all, Versus You return with what I would consider their best record to date, and I feel like Worn And Loved has the potential of helping a few people who might be going through a rough time, by telling them that it is OK to not be perfect, that it will become better. In that spirit, if you want to have a, what I expect to be, great night, be sure to come to den Atelier this Friday, where the band is inviting everyone to a release show, free-of-charge. For more information, you can head to the band’s Facebook page and in order to get pumped, listen to the track below.